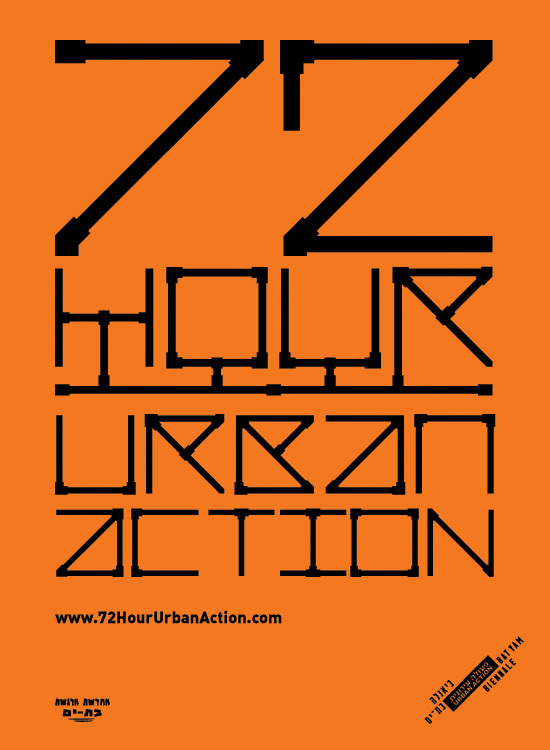 We really like the idea of the 72 Hour Urban Action, a rapid, real-time architecture competition at the 2010 Bat-Yam International Biennale of Landscape Urbanism in Israel. For this DIY pow-wow, organizers invite ten teams of architects, students, designers, artists and craftspeople who will be tasked “to respond to community needs and wants in relations to its public spaces.” Each team will be given up to $2,500 for materials, room and board, a central work space and a truck for transport. Engineers will also be on hand for construction and safety consultations. Starting on September 25, 2010, the launch date of the biennale, the teams will have three days and three nights to design and build their projects, some of which will be chosen to remain on site permanently. There's also a money prize worth $3,800 for the top project. The deadline for registration is August 8, 2010. That's only a few days away, so if you're interested, you'll have to hustle. Meanwhile, perhaps the entire Venice Architecture Biennale in 2012 could be turned into a massive 72 Hour Urban Action festival. Instead of installing also-rans from the previous year's Art Biennale or taking the pickings from an august atelier's dusty model museums or asking Zaha Hadid to make another sofa, the architecture world's elite and bright young tykes are flown in, given a slightly plumper budget and then let loose in Venice and the surrounding salt marshes, with some perhaps venturing inland to the industrial landscapes of Veneto. Just as at Bat-Yam, they have 3 days (could be longer) to design and build a project that meets a local social need or improves the urban experience. Biennale groupies can watch the teams while they work and then play around in/with the completed spatial interventions. They might even be asked to lend an extra pair of helping hands to hammer a few nails, to the horrors of biennale lawyers and insurance people. And in case you're wondering, the teams will be housed, fed and given working spaces at the Arsenale or in their country's pavilion. Also like at Bat-Yam, some of the projects will be allowed to remain permanently. Every couple of years, new projects are plugged-in to the built environment, perhaps even to an earlier intervention. In this way, Venice and its environs are continually reshaped and renewed. After countless biennales, we might have two Venices. There's La Serenissima, flooded and crumbling. Above it is the newer Venice built out of all the accumulated projects. This encrustation of ad hoc interventions is where the indigenous Venetians live and work, where the tourists buy their souvenirs after venturing down to the ancient city below. I'm a great fan of such time-controlled competitions - it reminds me of an idea at one British university, where students had to complete a garden design within 24 hours after visiting the client. Certainly, I think it creates spontaneous results rather than cold, calculating designs. If I'd known, I would have attempted to put together a Polish team!